If you pinch a nerve in your wrist, you could develop carpal tunnel syndrome, a condition that makes your hand or arm feel numb or tingly. This can make your hand feel weak and make it harder to do everyday activities, especially if you have a job that requires a lot of time on the computer. Carpal tunnel syndrome is a condition that is usually easy to treat. With treatment, you should be able to heal over time and get rid of the numbness and tingling associated with carpal tunnel syndrome. Some of the strategies that can relieve your carpal tunnel syndrome pain are simple to begin. As soon as you begin having symptoms, you should start the treatment process right away to keep the condition from worsening. Wrist splints– Using a wrist splint can help relieve your pain and keep your condition from worsening. The splint keeps your wrist in a position that relieves the pressure on your nerves. You can even wear it while sleeping so you don’t put unnecessary strain on your wrist while your rest. Nonsteroidal anti-inflammatory drugs (NSAIDs)– Using NSAIDs may help to reduce the swelling and pain related to your carpal tunnel syndrome for short-term relief. Talk to your doctor to determine the best course of action for your carpal tunnel syndrome, especially if the simple strategies do not provide relief. 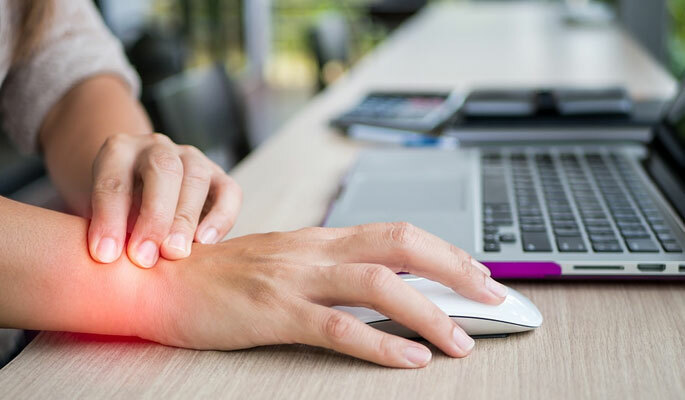 If the simple strategies for pain relief do not help you feel better, you may need to try a more advanced strategy for your carpal tunnel syndrome. For example, your medical team could inject the injured area with a corticosteroid. These cortisone shots can help get rid of some of the pressure on the median nerve to help lessen your pain. They can also reduce the inflammation and swelling in your hand or wrist. If your carpal tunnel syndrome is particularly bad, you may need to get surgery to relieve your pain. Talk to your doctor to see if this is a necessary step for you. There are two different options for carpal tunnel syndrome surgery: either open surgery or endoscopic surgery. Either option may take some time to heal, but both can provide relief for your advanced carpal tunnel syndrome. If possible, you want to try to avoid carpal tunnel syndrome, especially after you work to treat it. Keep your wrist brace and use it when needed. Take breaks from the computer or whatever activity causes the strain on your wrists. If swelling or pain begins, ice the area to reduce the swelling. Try to keep your wrists straight or keeping a slight bend in them while doing the activity that caused your condition in the first place. Get your doctor’s advice to keep your carpal tunnel syndrome under control. This condition is easy to treat, but can be a massive inconvenience while it is going on. Take care of yourself and be proactive about keeping carpal tunnel syndrome at bay.